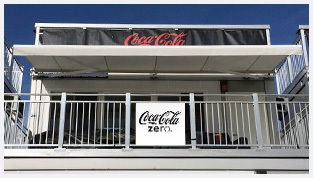 We offer additional 'Awning Coverage Options' for all our custom seating systems. //We offer additional 'Awning Coverage Options' for all our custom seating systems. We offer additional ‘Awning Coverage Options’ for all our custom seating systems. We understand the complexity of creating the perfect seating venue. Whether you looking to create shade for outdoor events or just need some additional coverage for your VIP section, Seating Solutions has got your ‘Covered’. Create shade, protection and comfort anytime you want–with the touch of a button. Our motorized retractable awning makes your event seating as much as 20-degrees cooler, while guarding your guests from harmful UV rays. Our sales team is available to answer any questions regarding pricing, quotes, installation requirements and more. Click the link below to download a product deck. Adjustable heights with motorized retractable awning for automatic roll out and up. Elbow design incorporates a welded chain link and drop forge chain link receiver, which increase strength of the awning structure. Please note that the awning system should NOT EVER be used in hurricane force winds. However, it can be used in 0-35mph winds and gusts up to 40mpg.